Does your teenager drive? Wouldn’t it be a blast to send them on an Easter Scavenger Hunt For Teenagers Who Drive? We’re talking about an Easter adventure here! Freedom to hit the road and experience independence! Easter for Teenagers does not end at the ripe old age of 12! Egg hunts may be a thing of the past but there is still much FUN to be had! Are you ready to send your teenagers on an Easter Adventure? The Easter Scavenger Hunt For Teenagers would probably be best done over Easter weekend to give your teens plenty of time between video games, sleep, and family events! 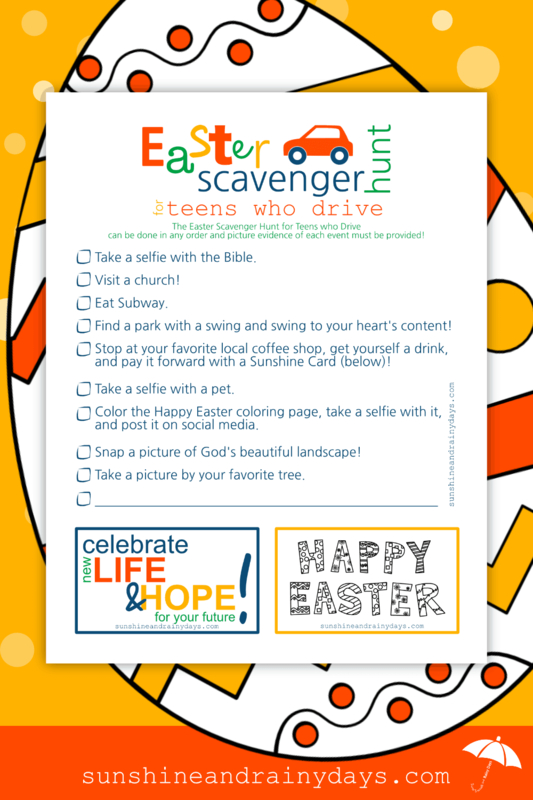 Easter Scavenger Hunt For Teens Who Drive Printable (printed on card stock). Subway gift card or cash. Money for your teen’s favorite coffee shop plus $5 to pay it forward. 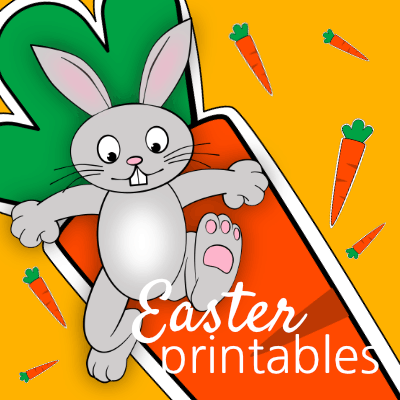 Happy Easter Coloring Page Printable and colored pencils. Phone or camera for picture evidence. Easter Basket or Surprise for the end of the hunt! Give your teenager the supplies mentioned above Saturday morning, the day before Easter. Cut out the Sunshine Cards on the Scavenger Hunt list. Your teenager can choose to color the Happy Easter Sunshine Card or use the ‘celebrate new life and hope for your future’ Sunshine Card. We have more Sunshine Cards too! Encourage your teenagers to take their time and Enjoy The Hunt! Remind your teen driver that you must receive picture evidence of each event. Provide an Easter Surprise for the end of the hunt! What About The Blank Line? There is a blank line to add an additional Easter Adventure to the Easter Scavenger Hunt Checklist. Go see a movie of your choice with movie tickets provided. Provide You’ve Been Egged! supplies to Egg a friend’s house. Take a selfie with Easter candy at your local grocery store. Wow! Isn’t this FUN? Your teenagers are sure to be thrilled that you have encouraged them to get out and hit the open road for an Easter Adventure! I take no responsibility for your teen’s driving! I’m just here to provide a little Easter fun!